Shipping is available for this auction at buyers expense. All packing a shipping will be done the week following the auction August 29-Sept. 2. All items will be shipped via USPS except ammunition which will ship UPS. CLICK HERE TO BID ONLINE!!! Beautiful collection of Firearms; many never fired. Large selection of “new in box” firearms; never fired!!! And others!!!! Please Read Gun Rules, BEFORE Bidding! Attached at bottom. Ducks Unlimited shot guns, Smith and Wesson Pistols, L.C.Smith Side By Side, Winchesters Rifles, Set of Belgium made Browning shotguns, H&K Fabarm, Charles Daly, Beretta Shot gun,Winchester shot guns, Fausti, Remington shot gun, Weatherby over under, Hopkin/ Allen .38 shotgun, Huglu 28 Gauage, New Guns by Walther, S&W, Ruger, Mossberg, Henry, Hi-Point, Chiappa, Beretta, Rock Island Armory, Springfield, Thompson, Heritage, Cobra, Keltec, Diamond Back, Bersa, Winchester, Remington, High Standard and many, many more!!! 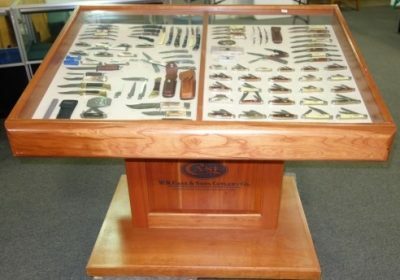 Collection of Case and other knives: Beautiful Cherry display with over 90 Case knives and belt buckles, honing tools and more!!! 1999 retail set!!! Must see!!! 2 sets of Case Centennial Knives: 1 set in Stag Handle and 1 set in Red Bone Handle!!! Case Astronaut Knife!! Collector knives such as: John Wayne Commemoratives, World War II Commemoratives, UT Sugar Bowl, Viet Nam Commemoratives, 75th Anniversary, Coca-Cola Collectible, S&W Switch Blade and lots of 2,3 and 4 blade folding pocket knives!!!! Great Collection!!! Ammo: Federal, Remington, Blazer and more: 22 cal., 9mm, .223 cal., .308 cal., 40 S&W, 7.62x39mm, 12 ga., 20 ga., 28 ga. and more!!! Coins: Lots of graded Silver Eagles: First Strikes, West Point mints; Carson City Silver Dollars; Morgan Silver Dollars; Proof Sets; Booby Head Large Cent; Gold Coins; mint sets and more!! Pocket Watches: Waltham, Hamilton, Elgin, Baylor, Illinois (Burlington) and others!!! BID LIVE OR ON LINE!!! !